Engage a gear (first if the car is faced uphill or reverse if it is faced downhill) and leave the wheels steered. Block the wheels with a wedge or a stone if the car is parked on a steep slope. Do not leave the ignition key at MAR to prevent draining the battery. Always remove the key when you leave the car. The handbrake lever is located between the two front seats. 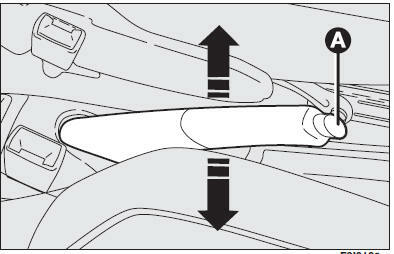 Pull the handbrake lever upwards until the car cannot be moved. Four or five clicks are generally enough when the car is on level ground while nine or ten may be required if the car is on a steep slope or laden. IMPORTANT If this is not the case, contact Fiat Dealership to have the handbrake adjusted. When the handbrake lever is pulled up and the ignition key is at MAR the panel warning light will come on. unattended in the car. Always remove the ignition key when leaving the car and take it out with you. Keep button (A) pressed in and lower the lever. Warning light x will go out. Press the brake pedal when carrying out this operation to prevent the car from moving accidentally.